Never miss another conversation. 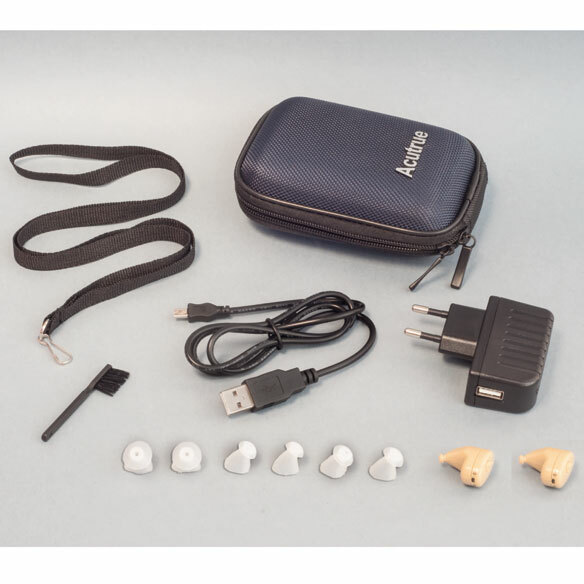 With this set of 2 AcuTrue® rechargeable hearing amplifiers, you can use one while the other is charging, or use in both ears for even sharper, high-definition sound. Includes two 1.2V sound amplifiers with built-in volume control, 6 silicone tips (2 each of small, medium and large), adapter and 29"L charging cable, brush, and 5"L x 3 1/2"W x 1 1/2"H carrying case with 15"L strap. 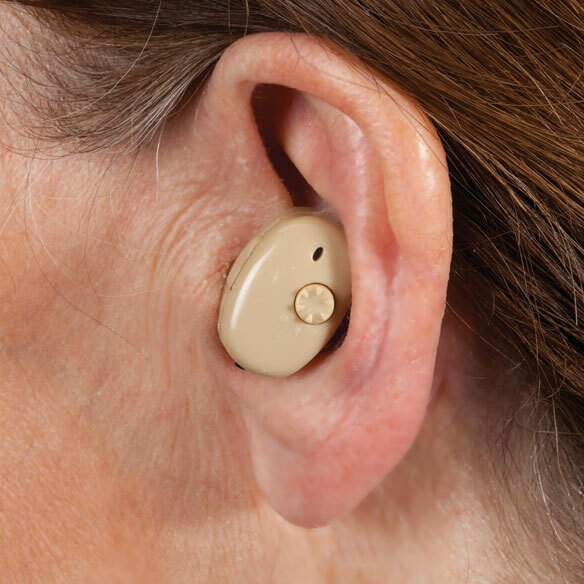 Ear amplifier fits discreetly inside the ear. Provides 10 hours of uninterrupted operation. Fully charges in 8 hours. Maximum acoustic output 124 dB. Amplifier frequency response 209–2735 Hz. The AcuTrue Recharechable hearing amplifier was too large for my ears. When I put them in they fell out. They are soft and warm. For my grandma to try. Age has caught up with me and I have to keep asking people to repeat themselves so now I won't have to ask. Getting hard of hearing and these sound like a good deal. my son needs a hearing aid! picture of slippers instead of hearing amplifier-? Needed a replacement for old one. My husband wanted a change from first ones , looked at these and wanted to try them. what is the recharging voltage? My instructions say 240 volts. BEST ANSWER: Thank you for your question. The voltage should be between 100-230w. We hope this information will be of help to you. I need a manual ? BEST ANSWER: My husbands came with one in the, but his never worked, so we got rid of every thing. try looking on the companies site and see if they can send you one. Sorry I couldn't help. If you order 2 hearing aid ,does it come with two chargers? BEST ANSWER: Thank you for your question. The set only comes with one charger. We hope this information will be of help to you. If you find it does work can you send it back & get your money back.? BEST ANSWER: Thank you for your question. You would have to send it back. Once we receive it back a refund will be issued for it. We hope this information will be of help to you.